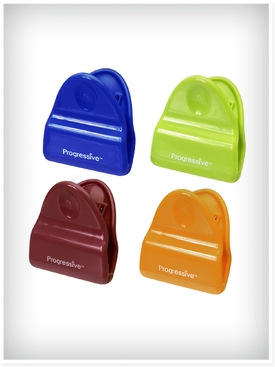 The Progressive Mini Magnetic Bag Clips are perfect for any little job. These Magnetic Bag Clips feature a strong spring and non-slip grip that holds tight onto any bag or package. The chip clips built-in magnet on the back makes them easy to store on the refrigerator, stove or other magnetic surface. Set of 4 chip clips. Use them to hold grocery or to-do lists on the fridge. Clip and magnet recipes to the stove for quick reference.